Once you’ve purchased your speakers, receiver, TV and accessories and have hooked everything up, it’s time to address all of the wires and make things look as clean as possible. This article will guide you through the best solutions for cable management as well as go over some strategies for running wires to the surround speakers. Follow theses tips and you’ll have a system that blends seamlessly into your room while you enjoy your movies and TV like never before. If you’re looking for tips on how to hook everything up, you can back up a step and read our blog here. Wiring up the surrounds can be the single most challenging aspect of getting a home theater setup installed. In fact, it can be such an intimidating task that many folks who opt for a cheaper home theater in a box system, never get around to hooking up the surrounds. Which is a shame because they are missing out on the complete immersive experience that a surround system can provide. Of course you don’t want wires running over the carpet or hanging obviously on the walls either. There are a few methods to making these wires as inobstrusive as possible. If you are building a new house, save yourself the effort and have all wiring run behind the walls before they are closed up and then have the wire exit via holes or wall plates. For existing construction, if the home theater will be on the top floor of the house, running the wires up through the ceiling into an attic or crawlspace makes for a pretty easy solution. You may have to cut or drill holes and then snake the wires behind the wall to where the surrounds will be located. To begin, use a stud finder to make sure that you avoid the studs when cutting the initial hole. Once the hole has been cut, attach the wires to a long flexible pole, and then push the pole through the wall to its destination. For really long wire runs, you may have to cut extra holes along the way to keep the wire going along its path and then patch them up later. 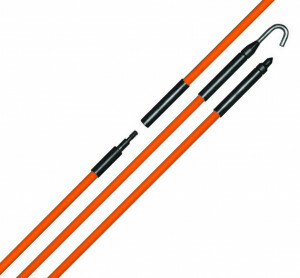 You can even get poles that are specifically designed to run wires with hooks on the ends like these. The fiberglass material makes them easy to go around studs, but they can snap if you try to run them around a corner. Another option for fishing behind walls is to use a magnetic attachment on the wire and then a magnetic roller to guide the wire. It’s a little pricey but you can get here. Here’s a videodemonstrating its use. Of course this won’t be an option for walls with metal studs. Running the wires in the corner where the wall meets the ceiling and then painting them to match is fairly inconspicuous. Depending on how far from the ceiling the surround speaker is, you may want to then run the wire behind the wall when it drops down to connect to it, which is fairly easy. 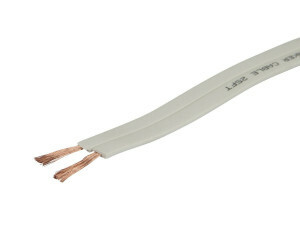 You can get flat speaker wire like this which has adhesive for attaching it to the wall, or you can even run it underneath the carpet in an area that doesn’t get a lot of traffic. 16 gauge wire is the thickest I have seen, which is fine for runs of wire around 20 feet. For longer runs though, you may want to use thicker wire to keep impedance from degrading the signal. You can check out this guide to wire gauge atAudioholics. You can get a wireless surround kit like this one. 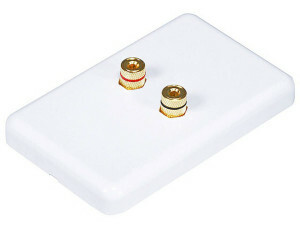 They are very straight forward to install, simply wire the surround channels of your receiver to the transmitter and then wire the speakers to the wireless receiver at the back of the room. So as you can see, yes, wires are still involved in this “wireless” solution, but they only need to be run a short distance from the speakers to the wireless receiver. It works fairly well, but one caveat, they can be susceptible to interference from Wi-Fi. After you’ve decided on how to run the wires for the surrounds, it’s time to make everything look nice and tidy. Using wall plates like these rather than having the wire come straight out of the wall will make the installation look more professional. 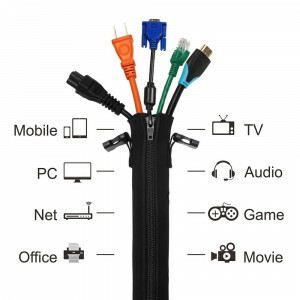 If A/V cables are running up the wall to a mounted TV or will be in any other noticeable location, you can use a cable management sleeve to gather them all together and hide them, which are al so available in a variety of colors. Zip ties will also go a long way to cleaning up the wires behind your A/V rack. You can also use wire channels to help hide wires on your wall or floor. They make flatter styles of channels that are specifically designed to be put on the floor. Using wire channels is another way to go if you end up running the wires outside of the wall. You can find a ton of other cable management products at great prices over at Monoprice, which is an excellent source for no frills audio accessories. Of course you can find accessories like speaker wire, subwoofer cables and banana plugs on our site. We also sell stands and mounts that can be used with our speakers as well as a variety of other manufacturers. We hope this article has been helpful in laying out how to integrate a home theater setup into your room with as little visible wiring as possible. Taking the extra time to hide wires will not only give your home theater a clean, sophisticated look, but it will help the other members of your household be just as excited as you are about your new system. Thanks for reading and as always, happy listening!